The majestic jaguar god of the Aztec, Inca and Mayan cultures stalks the dense rain forests of the Amazon basin. Although he lives in other regions of Central and South America, the Amazon is home to the largest population of the species Panthera onca. Zoologists believe this area is critical to the survival of the jaguar species, which the native Yanomami tribe revere as the "Eater of Souls." The jaguar loves water, so it's no surprise that rain forest and flooded swampland are his preferred home territory. Ideally the water is in dense forest, where he's difficult to spot among the foliage. The jaguar has no predators here: his only enemy is the human hunter. He's a solitary animal, and the only time you are likely to spot more than one at a time is when you see a mother with cubs. The Amazon basin lies in central and east Brazil. This forest region, which covers 130,000 square miles, has a particularly high density of lianas, which are woody vines that climb up trees. Lianas provide fruit and flower foods for the herbivorous wildlife, and create pathways for animals to travel below the high tree canopy: they make the basin an ideal habitat for many species. According to the WWF, the jaguar shares his home here with 161 mammal species and 556 species of birds. Rain forests teem with animal life of all sizes, although the carnivorous jaguar is usually interested only in larger prey. His diet ranges from deer and tapirs to tree-dwelling sloths and monkeys. Lizards, snakes and fish also feature and he can kill these smaller animals with one swipe of his paw. With larger animals he uses a stalk-and-ambush approach, and kills by piercing the skull with his canine teeth. His strength is such that he can haul his dead prey up into a tree, where he can eat in peace. Professor Martin Main reports that this region is critical to the survival of the jaguar species, not just because it is the big cat's ideal habitat, but also because the Amazon basin provides access to other ecosystems that support the jaguars' survival. His role as top predator is vital to the balance of this ecosystem, which in turn provides him with his diet. Unfortunately, conservationists consider the jaguar's Amazonian habitat an area under threat. This ecoregion has few protected areas, and the Transamazon highway crosses the region. The road may have advanced the fortunes of timber and mining companies, but its wildlife inhabitants are losing habitat through deforestation, uncontrolled forest fires and degradation of air, land and water quality. The IUCN classifies the jaguar as "near threatened" because of the loss of habitat caused by human activity. As the IUCN Red List points out, jaguars are still present in abundant numbers, even if they are notoriously difficult to spot. 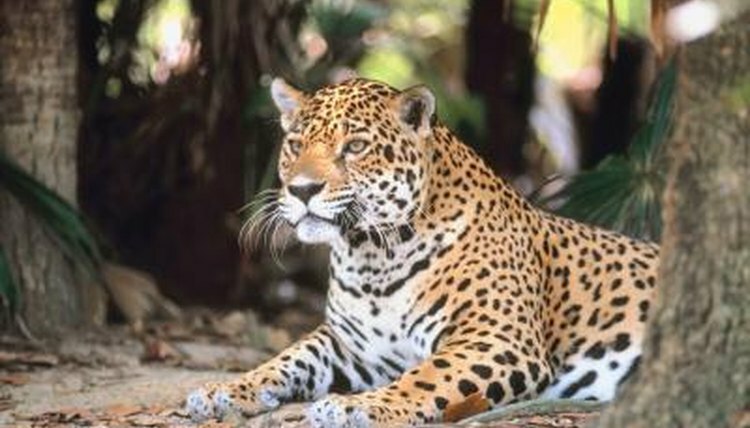 It adds that the Amazon basin represents the jaguar's best hope of staying off endangered species lists. Although anti-fur campaigns have reduced the numbers of commercial hunters killing him for his skin, some still persist in shooting this animal for his teeth and paws, while cattle farmers shoot him to protect their herds.